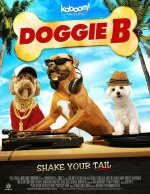 Doggie B Movie Shake your tail. Doggie B release date was Friday, August 31, 2012. This was a Limited in theaters release. When aspiring vet Cassie finds out that her Uncle Peter’s dog dancing studio is in danger of closing, she enters her devoted pup Pijo in the Dog Dancing Championships. Standing between the grand prize and the glory is ten-time champion Gertrude and her dancing canine Chaos, who will stop at nothing to win. With the help of family and friends, Cassie and Pijo lace up all six dancing shoes, raise the woof, and take on the competition tail on. added the tagline: "Shake your tail."